What if I told you that the federal government spends billions of tax dollars every year on higher education institutions that leave most of their students earning below the average high school graduate? Would you believe it? Well, it’s true. Last year, the government disbursed $22.6 billion to 2,076 institutions that left more than half their students earning less than their high school graduate peers. And, unfortunately, that’s just the tip of the iceberg. Some institutions showed nine out of 10 students earning below this amount. One of the most important outcomes in higher education is whether students who enter an institution ultimately leave with an award or degree in hand. Not only are those who complete likely to earn substantially more during their lifetime (84% more for a bachelor’s degree holder), they are also three times less likely to default on their student loans after they attend.2 Earning a college credential is still a critical steppingstone for most to enter today’s middle-class. Yet, last year, taxpayers sent $106 million to 18 institutions that graduated fewer than one out of every 10 students who entered their doors eight years prior. In fact, only 2,070 out of 29,136 students who entered these institutions in 2009-10 (and never transferred) left with a certificate or degree in hand by August 2017. While these schools represent the worst completion rates in the United States, many institutions also show extremely worrisome outcomes. In fact, there were 178 institutions that leave more than three-quarters of their entering students without any sort of credential. 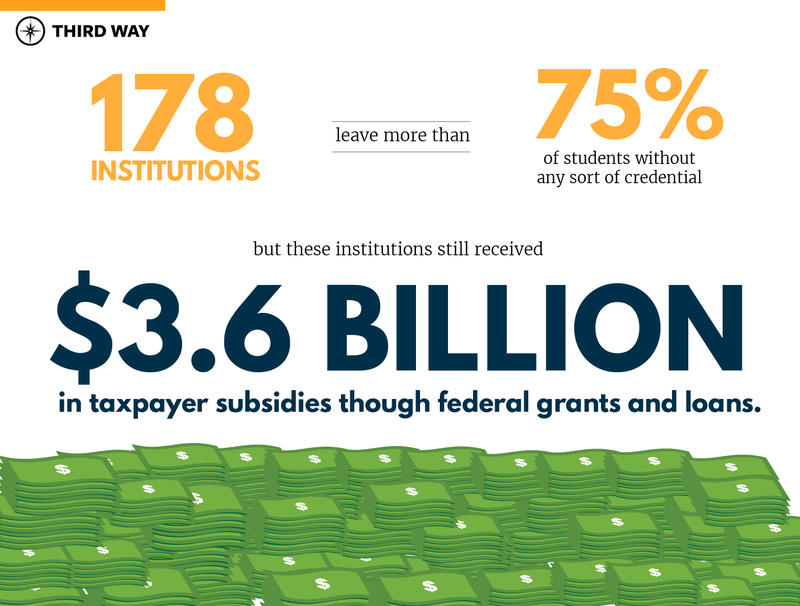 Even so, these institutions still received $3.6 billion in taxpayer subsidies though federal grants and loans in 2017 alone. One federally funded institution that shows extremely low completion rates is Bossier Parish Community College, a public two-year institution located in Bossier City, Louisiana. While this institution received over $45 million in federal student aid just last year, they display a completion rate of only 8.8%. Out of the 6,040 students who entered in 2009-10 and never transferred, only 529 left with an award or degree in hand by 2017. Even worse, 43% of students who attended Bossier last year borrowed over $27 million in federal educational debt. Being that most will leave without any sort of credential, it’s likely that many will end up in the worst-of-the-worst situation, with debt and no college degree to show for it. Incoming students consistently rank better job opportunities as the most important reason to attend an institution of higher education.3 To help determine whether an institution is delivering on that promise, the US Department of Education (Department) measures the percentage of student borrowers and grant recipients who earn more than a high school graduate within six years of entering an institution. If most students earn less than a high school graduate — measured to be $28,000 per year — after spending time and money to attend an institution, it may not be financially worth it for students or for the taxpayers who help subsidize their educational endeavors at these low-performing institutions. Even so, last year the Department disbursed $808 million in student grants and loans to 409 institutions that each leave more than three out of every four students earning below this low benchmark of economic success. Seventeen of these schools left more than nine in 10 students earning less than the average high school graduate, yet still received $13 million in federal student aid. One of those institutions is Centura College, a for-profit institution based out of Virginia that primarily offers associate’s degrees. While Centura offers career training programs that claim to prepare students to enter the fields of healthcare, welding, and business management, many struggle to earn livable salaries after attending. In fact, out of the 3,736 students who entered the institution in 2007-08, only 758 (20.3%) were shown to be earning more than $28,000 per year by 2014-15, six years later. Even so, Centura received over $14 million in federal student aid just last year, an investment that may never show its dividends to the students who receive federal student aid to attend, or to the taxpayers that help fund Centura’s operations. Since the average bachelor’s degree recipient now leaves school with $30,000 in student debt, it’s critical that institutions prepare students to obtain financially secure employment that allows them to pay down their loans over time.4 If students are unable to earn enough to make sufficient payments toward their educational debt, the institution they attended my not be providing an adequate return on their educational investment. To help determine whether institutions are leaving students with manageable student debt after they attend, the Department uses a loan repayment rate to measure the percentage of students who are able to pay down at least $1 on their loan principal within five years of leaving. If most students are unable to make sufficient loan payments to, at least, cover their accumulating interest, it may suggest that the cost of the institution is too high, that the financial benefits of attending are too low, or both. Last year, there were 223 institutions that showed more than three-quarters of their former students owing even more on their educational debt than the amount they initially borrowed, even five years after leaving the institution and entering repayment. Out of the 359,009 borrowers who left these institutions and entered repayment in 2011-12, only 75,365 have made large enough payments to make a dent in their loan principal by 2016-17. 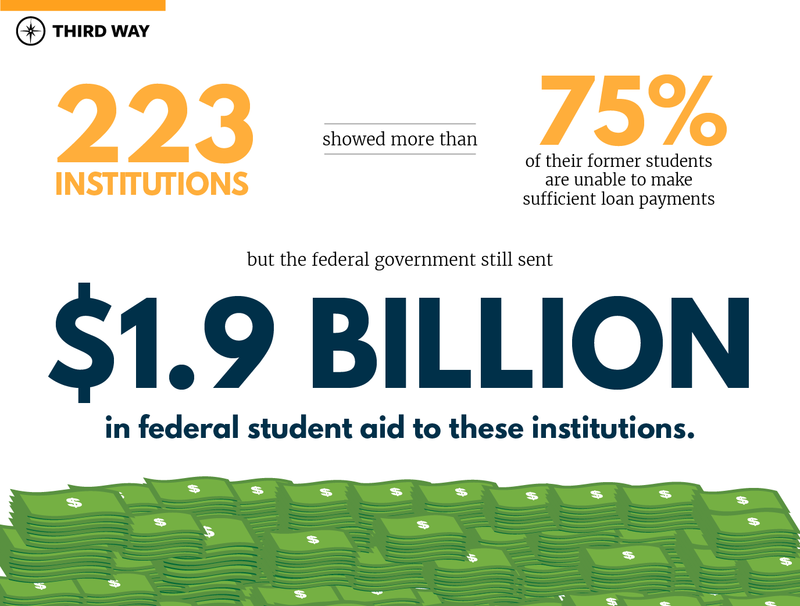 Yet, even with such a risky investment, the federal government still sent $1.9 billion in federal student aid to these institutions last year. One institution that fails to provide a sufficient return on students’ educational investment is Healthcare Career College, a for-profit institution located in Paramount, California, that primarily offers certificates in health-related professions. Last year alone, students borrowed $1.7 million in federal student loans to attend Healthcare Career College; however, it’s more likely than not that most will have trouble paying down this debt over time. In fact, out of the 499 students who took out loans in 2011-12, only 94 (18.8%) have been successful in paying down at least $1 on their loan principal five years later. This is not surprising given that only 22% of former students earn more than the average high school graduate. Yet, schools like Healthcare Career College remain eligible for federal student loan dollars year after year with few checks and balances to ensure that students are leaving better off than before they attended. Even though some institutions fail to graduate most of their students — leaving them financially insecure and with unmanageable debt — they still remain eligible to receive the large pot of federal funds doled out to institutions every year. It’s time that the federal government start better targeting its money toward institutions that are proven to serve students from all backgrounds well. As Congress works toward reauthorizing the Higher Education Act, it’s critical that policymakers demand better outcomes for federal funding. If they don’t, it’s likely that students and taxpayers alike will continue to provide billions of dollars to institutions of higher education that fail to provide the socioeconomic mobility that they promise. This paper uses data and methodology obtained in the State of American Higher Education Outcomes in 2019, a paper released by the author in April 2019. Full methodology can be found here: https://www.thirdway.org/report/the-state-of-american-higher-education-outcomes-in-2019. Anthony P. Carnevale, et al. 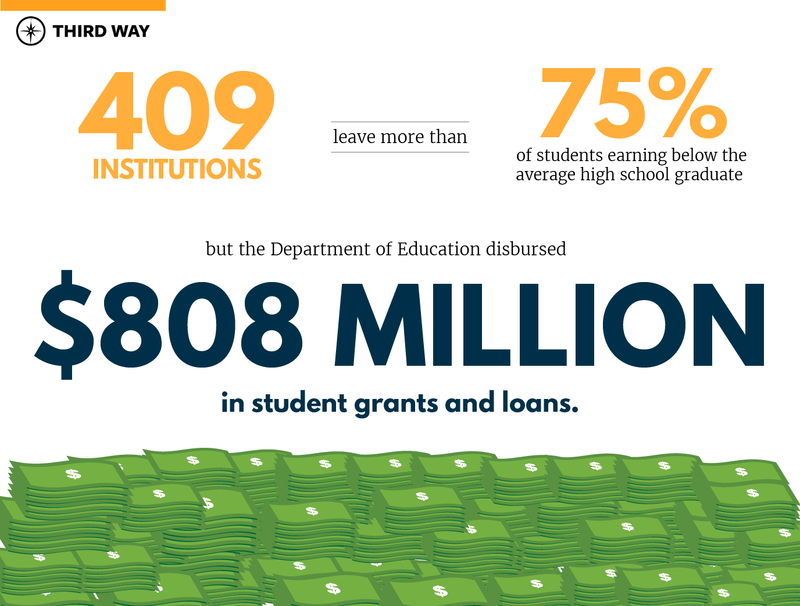 “The College Payoff.” 5 April 2011, https://cew.georgetown.edu/cew-reports/the-college-payoff/#infographic. Accessed 11 Mar 2019; See also, US Department of Education. “Fact Sheet: Focusing Higher Education on Student Success.” 27 July 2015, https://www.ed.gov/news/press-releases/fact-sheet-focusing-higher-education-student-success#_ftn8. Accessed 9 Apr 2019. Kevin Eagan. “The American freshman: National Norms Fall 2015.” Cooperative Institutional Research Program at the Higher Education Research Institute at UCLA, https://heri.ucla.edu/pr-display.php?prQry=196. Accessed 9 Apr 2017. “Trends In Higher Education,” College Board. 2017, available at: https://trends.collegeboard.org/student-aid/figures-tables/cumulative-debt-bachelor-degree-recipients-four-year-institutions-over-time. Accessed 9 Apr 2019.